Today is Wednesday and as usual I’ll share my reading and knitting with you and all the people who take part or read the Yarn along Posts over at Ginny’s. Today let me start with this: Wooohoo, yay, yippieh, juchee! *grinning like mad, dancing around like a crazy person* Yesterday I received this picture: It fits! My long-time project, the Christmas Sweater for my brother, did not only arrive in time for his birthday yesterday (Happy birthday, little brother, by the way!) but it also fits! Isn’t that cool? I was so worried it wouldn’t fit and I would have to try and fix that, having to rip out all those colourwork. Luckily I let Michael try it on on Saturday morning before I mailed it. He wouldn’t get his head through the neckhole… So I ripped that out (which was at least not that difficult), cast on quite a few more stitches and quickly knit a new one – literally two hours before the post offices closed. Then I packed it and went to the post office and faced an enormous queue. But I was lucky and was able to mail the package and now it has arrived in time plus I got back that selfie from my brother. Ok, I guess, had he known that I would post it on my blog, he would have tried to look a bit less goofy, but hey, that’s the digital world, you send me your picture, then you can’t be sure I won’t be posting it 😉 Now over to that blurry picture (it’s too dark when ever I’m at home). Other than that I knit a lot on the last Phoebe Sweater. I’ll finish the body this week. I’m more than half way done already. 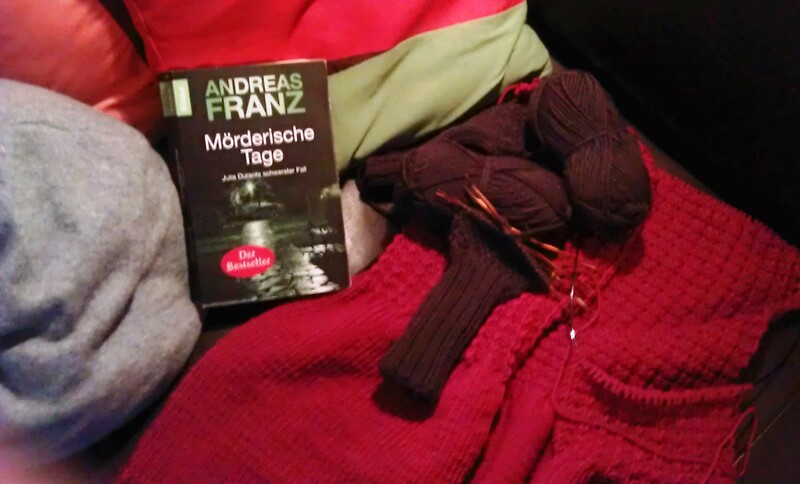 And I knit a little bit more on the gloves for Michael. Somehow this week I didn’t get that much done but well, having been out most nights and for the weekend where should that knitting time come from? As for reading I’m through with the Catching fire. What a cliffhanger ending! And I started a new crime story for a break. And I ventured seriously into the Christmas present list business. My family is a “we rather get books as presents then to buy them ourselves” family so I like giving and receiving book for christmas. But what book fits best? I’m researching this right now. Hope I get my list ready for shopping when I’m home at my parent’s house for the next weekend. Then I’ll buy and have everything there already. This will be helpful because I might go to London before christmas and from there straight back to my parents. And what’s the reason to take presents from Düsseldorf to London and from there back to Frankfurt when I could avoid it? This entry was posted in Knitting & Crocheting and tagged Cardigan, Knitting, Sweater, Yarn Along by kathatravelling. Bookmark the permalink. Congrats on finishing the sweater! I just love seeing the finished gifts on happy recipients. 🙂 And I’m glad our brother properly appreciates a reindeer sweater! getting books is the best! I remember one Christmas morning when there were no books amongst my presents, and I was surprised by how sad I was about it! 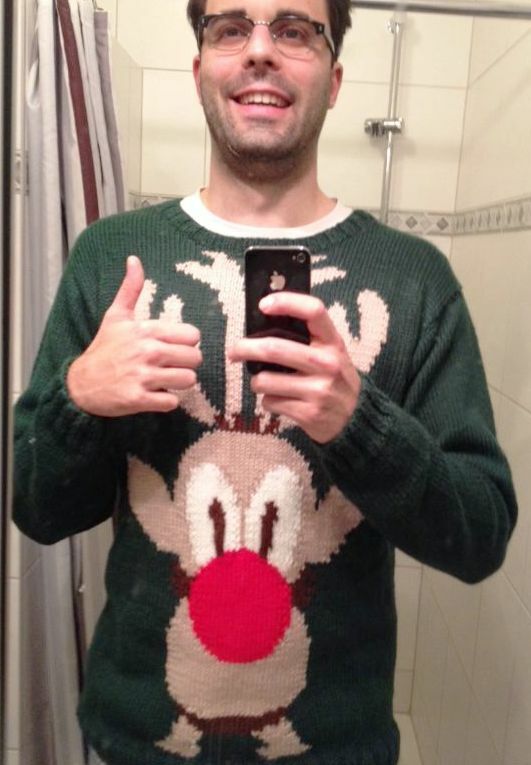 What a fantastic Christmas sweater, it looks brilliant! That sweater looks exactly like the one Colin Firth wears in ‘Bridget Jones’ Diary’. I love it! Great job! that christmas sweater turned out great! makes me want to cast on a sweater for myself 😀 lovely! You are a great sister! I’m so glad it fits him. That’s always a concern when knitting sweaters for gifts. Thanks and yes, isn’t it? I was really a bit fidgety, it would be too tight around the arm/shoulder part or that the sleeves would be too short (both things that would involve soo much frogging). How cute… Not sure I have the patience for the colorwork. This surely will be a gift that will be treasured for a lifetime! Thanks! Honestly, don’t ask me how I got through that work… 😉 Plus I started in April.